Monroe Misfit Makeup | Beauty Blog: Paula's Choice CALM Sensitive Skincare Routine & GIVEAWAY! Paula's Choice CALM Sensitive Skincare Routine & GIVEAWAY! This post is Sponsored by Paula's Choice. All Opinions are my Own. I have always considered myself to have sensitive skin but as long as I stuck with products that weren't known to be irritating it wasn't an issue. Recently my skin and I went in to full battle after an allergic reaction and I was all but forced to find gentle skincare products to help heal my skin. Paula's Choice CALM Redness Relief is the must-have solution for sensitive skin. This new collection aims to soothe redness and irritation with gentle formulas for both dry and oily skin types. Be sure to enter the Paula's Choice CALM Giveaway through the Rafflecopter at the end of this post. You can win your own customized Paula's Choice Skincare Routine products valued at $150! Recently after using a new medication and at the same time having mold exposure from a household renovation I developed an allergic reaction. My decent skin on most days erupted in to an itchy red rash with signs of rosacea on my cheeks. While I stopped the medication and the reaction subsided I was still left with lingering redness and bumps weeks later. I began to understand how frustrating it must be to deal with sensitive skin, rosacea, and acne on a daily basis. While I normally enjoy putting on makeup, I was now using it as a 'cover up' and even then I still felt self-conscious. Instead of throwing my hands up in aggravation I took the opportunity as a way to try out products that could help these types of skin issues. Now I know when I meet someone with complaints of rosacea, redness, or sensitive skin I can point them straight in the direction of the Paula's Choice CALM Redness Relief line. 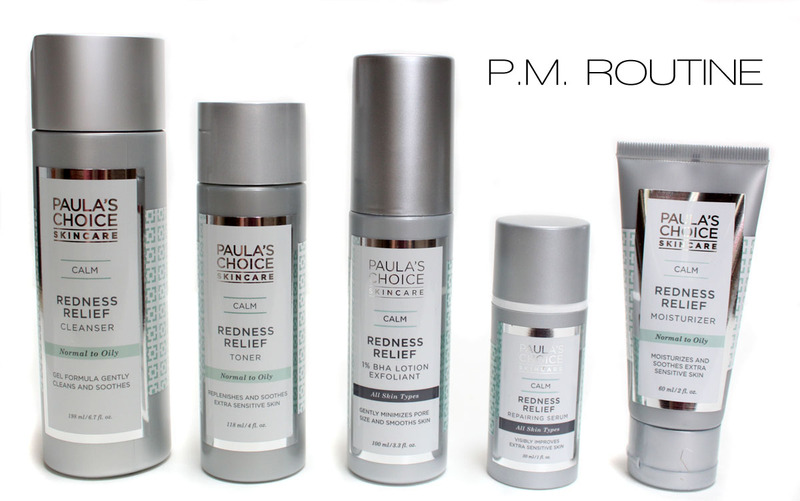 Paula's Choice CALM Redness Relief Line for Normal/Oily skin contains 6 products: Cleanser, Toner, Exfoliant, Serum, Day Moisturizer with SPF, and a Night Moisturizer. This complete collection works together to gently reduce redness and signs of irritation with comforting, moisturizing formulas. I have combination skin so I am using the Normal/Oily line. It is also available for Normal to Dry skin. Morning and night I cleanse with the Calm Redness Relief Cleanser, a lightweight gel cleanser that gently removes makeup and excess oil while soothing red, irritated skin. I am so pleased with this cleanser! It is unbelievable gentle while effectively removing makeup. I was using the RESIST cleanser from Paula's Choice before but found it too aggressive to use twice a day. The Calm Redness Relief cleanser was my answer to a gentle morning cleanser. The refreshing gel texture feels soothing and doesn't leave the skin feeling dry or tight. After cleansing I like to use a toner day and night. This water-light toner for normal to oily skin gently reduces redness and irritation as it lightly hydrates skin. It feels soothing and creates a smooth canvas after cleansing and before makeup. Calm Toner helps to normalize & ease irritated skin. It has anti-oxidants and anti-inflammatories to help diminish redness. This toner is so gentle and leaves the skin feeling soft and hydrated. It really helps to calm down the redness in my cheeks and any blemishes. The smell is a little funky, but I can get past it for how smooth it makes my skin feel. Calm 1% BHA Exfoliant was the product in the line that I was most looking forward to. I have had excellent results with Paula's Choice 2% BHA but my skin can only tolerate the 2% a couple times a week. I was hoping the 1% would be gentle enough for daily use. I think I may like this one even more! This lightweight BHA lotion exfoliant for sensitive skin soothes redness while unclogging pores and diminishing their size. Much like the 2% BHA it obliterates pores making your skin beautifully clear. I used this over several days and never experienced any irritation, it also took down my red bumps and redness quickly. Even 30 minutes later the redness in my skin was visibly less. I apply it only at night and that seems to work just right for clearing the pores while not irritating my sensitive skin. This anti-oxidant rich serum soothes irritated skin and calms redness with gentle, yet highly effective ingredients. A good serum does wonders for the skin, I even opt for using just a serum over moisturizers some days. Calm Repairing Serum is water-based not silicone which I appreciate. The water-like formula feels lightweight on the skin and makes a a nice smooth base for makeup. Sunscreen is one of the biggest irritants to sensitive skin so I was very happy Paula's Choice put a daily moisturizer with SPF 30 in this line. This gentle, mineral-based sunscreen reduces redness while moisturizing and protecting the skin. I apply this moisturizer in the morning, I love that I get hydration and SPF protection in oe. Best of all it doesn't cause me any breakouts The texture is lovely, moisturizing but not greasy, and it doesn't leave any white residue cast. It performs well under makeup too. For night cream I apply the Calm Moisturizer without the SPF. This moisturizer gently hydrates and repairs while reducing redness and irritation for smoother, more resilient skin. This lotion goes on silky smooth, hydrating the skin while also soothing it and locking in moisture. It doesn't feel heavy or greasy, just comforting and effective. You know the feeling of a great moisturizer when it completely sinks in and makes your face feel happy. The CALM Redness Relief line is perfectly suited for those with sensitive skin or not. I noticed a marked improvement in the redness and bumps and my skin felt hydrated and soothed. Even after my skin issues clear up I know I will be keeping many of these products in my daily skincare routine. While I am all about anti-aging skincare, sometimes it's nice to give yourself a break from intense treatments and just let your skin be calm and cool. I would highly recommend this line for any one battling ultra sensitive skin, redness, or rosacea or those looking to try luxury skincare on a budget without worry. Paula's Choice offers a 100% Money Back Guarantee (within 60 days), no animal testing and no irritating dyes or fragrances. Paula’s Choice is committed to customer advocacy, education and helping people find the best products for their skin. In fact, everyone can receive a FREE personal skincare consultation by calling this number: 1-800-831-4088. Be sure to check out the full encyclopedia of advice on the website, it has great information for every type of skin care concern. Here are a couple articles I would recommend reading if you have rosacea or sensitive skin. Get 20% OFF plus FREE SHIPPING on Paula's Choice products now with code PRIMPSPRING Shop now HERE!